Falling Leaves is a mystery medallion quilt pattern. The pattern is complete now, so skip ahead to see all of the instructions before you begin or take it one step at a time to keep the results a mystery. Let's look at the center medallion first, and think about fabric choices. The finished quilt has just two more fabrics than you see here, both mottled greens, similar in color and color value but one with a slightly larger print than the other. a light to medium warm background (shown as lighter fabric with shades of rust). If you have small yardages, choose more than five fabrics, because the pattern is suitable for a scrap quilt. Here's a peek at the first pieced border surrounding the mystery quilt's center medallion. Look at the fabrics you've chosen. Can you visualize how they'll look with this portion of the layout? **Used to make quick-pieced half-square triangle units. It's helpful to cut oversize squares and then trim the finished units back to their correct size after assembly, aligning the diagonal seam with the ruler's 45-degree line to ensure block halves are identical. Press seams towards the triangles. Center and sew the four rust triangles to the unit from step 1. Press seams towards the triangles. Pair a dark square with a light square. Use the sandwich method to create two half-square triangle units from the pair. Repeat to assemble a total of 12 units (completed units will measure 3-1/2" square for the wallhanging and 2" square for the miniature quilt). Group components as shown. Sew together to complete the block. Press adjoining seams in opposite directions where possible. Look back at page 2 for a glimpse of the mystery medallion quilt's first border, made from half-square triangle units in green and rust. Pair each light green square with a rust square. Use the sandwich method to make a total of (28) half-square triangle units from the pairs (completed units will measure 3-1/2" square for the wallhanging and 2" square for the miniature quilt). The border is illustrated above but don't sew the half-square triangle units to your center medallion just yet. 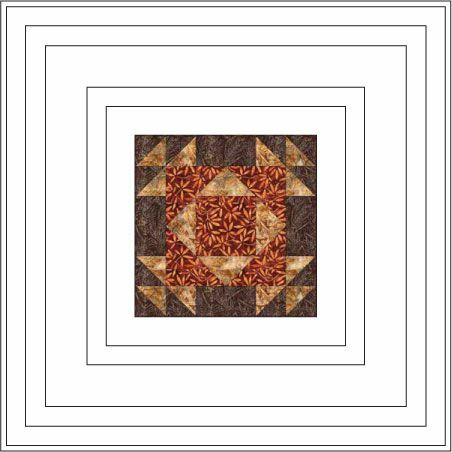 The Mystery Medallion quilt's first pieced border is made by sewing 28 half-square triangle units around the center block. The suggested layout is shown on page 3 and repeated in the upper left drawing on this page. Feel free to experiment with the layout. We've included two other possibilities for the units—play with arrangements and you'll discover more. Any layout you choose will work just fine with the next border. Once you're satisfied with the design, sew all units (except the corners) in the top row side by side, and then sew all units (except the corners) in the bottom row side by side. Press, taking care not to stretch the row. Sew the remaining units along each side into vertical rows. Press, again taking care not to stretch. Sew a row to each side, matching seam intersections carefully. Sew the top and bottom rows to the center, matching seam intersections carefully. Sew the side rows to the quilt. Press. The wallhanging's center should measure 24-1/2" square; the mini's, 12-1/2" square. If you're off just a bit, the next border will square it up. If the center is off a bunch, then square it up before you sew the border. Sew a dark neutral (brown) border around the medallion. Instead of measuring the unit's size, we'll use pieces cut to match the size the center should be at this stage (to make the next pieced border a breeze). Top/Bottom: (2) 2-1/2" x 24-1/2"
Sides: (2) 2-1/2" x 28-1/2"
Top/Bottom: (2) 1-1/2" x 12-1/2"
Sides: (2) 1-1/2" x 14-1/2"
Fold a top/bottom border in half crosswise and crease. Match its midpoint and ends to the top of the medallion, easing to fit where necessary. Sew the border to the medallion. Press allowance towards the border. Repeat to sew the bottom border. Repeat to sew each side border. The next border is a bit more involved, and the suggested patchwork is foundation-pieced. If you aren't a fan of this technique than there is an alternative later on in this tutorial. The next border is illustrated above and is made with 4" (finished size) foundation pieced quilt blocks (left) in three colors. Sewing brown corners on the block results in little "v" indent where the patches meet the border. On the right is an alternative border, made up of four-patch units (pattern on page 7) made from the background fabric and the darker green fabric. You can use any 4" (finished) blocks in the border. Cut only enough pieces for one block. Adjust patch sizes as necessary to suit your foundation piecing sewing style. 1-1/4" wide strips, cut selvage to selvage; total length will depend on your sewing style. 7/8" wide strips, cut selvage to selvage; total length will depend on your sewing style. Center a green square right side up on the foundation center, on the reverse side of the foundation. Align a background triangle right side down on one edge of the square. Turn the foundation over. Sew on the line separating the two patches. Flip the triangle right side up; edges should overlap the lines beneath that form its final shape. Trim back the seam allowance to just under 1/4" to reduce bulk. Working around the center, sew three more triangles in the same way (some people like to sew opposites instead of moving in a circular motion). Use the same method to sew four green triangles around the center. Align a background strip right side down along a green edge; ends must overlap the outermost foundation line. Sew, check placement and trim seam. Sew three more. Sew brown triangles to the corner slots. When flipped right side up, edges should overlap the outer perimeter of the template. Press and trim through all layers on the outermost template line. Here's an alternative four-patch border to replace the border from earlier. It goes together more quickly than the foundation pieced border does and is a good option for those of you who simply don't like the foundation technique. You may need an extra short strip of each if long strips do not have a usable length of 42" after squaring up. Sew a green strip lengthwise to a background strip of the same length. Press seam allowance towards the green strip. Square up one end of the strip set and then cut as many segments from it as possible. Make additional strip sets from remaining fabric. Cut a total of 64 segments. Arrange two segments as shown, with like-fabrics diagonal from each other. Sew together. Press seam in either direction or fan it out from the middle, pressing one half to one side and the other half to the opposite side. Make a total of 32 four-patch quilt blocks. We're almost finished with the mystery quilt. Add the pieced border first. Sew seven pieced border blocks together side by side. Press seam allowances either direction. Repeat to make another 7-block border. Sew nine pieced border blocks together side by side. Press seam allowances either direction. Repeat to make another 9-block border. Sew a 7-block border to one side of the quilt. Press seam allowance towards the plain border. Repeat on the opposite side of the quilt. Sew a 9-block border to one of the remaining sides. Press seam allowance towards the plain border. Repeat on the final side of the quilt. Sew two more plain fabric borders to the quilt. This example repeats the rust fabric used in the center medallion first, followed by a repeat of the dark brown fabric. The quilt is bound in the darker green. The pieced border probably brought the quilt into a square, but if it didn't, the final two borders are a perfect opportunity to do that. Press the quilt and mark for quilting if necessary. Sandwich, quilt, and bind.